Four raiders will be assigned a platform to stand on (Wardog, Axes, Chalice and Sun.) Jumping onto a platform will begin lowering it into the floor. Once all of the platforms are level with the floor, stand on them for a few seconds and the event will begin. The goal of the encounter is to complete an obstacle course (the gauntlet) in two phases. There is no boss for this encounter, it’s more like a game show, complete with fireworks and sparklers. The first phase will have two raiders take the role of runners and enter the gauntlet. The other four raiders will each be assigned to a platform (Wardog, Axes, Chalice and Sun) will assist the runners getting through the gauntlet in phase one. The entire encounter is set up in an arena. There are four quadrants - Wardog, Axes, Chalice and Sun - and a single platform in each quadrant towards the inner portion of the room. The guardians assigned to Wardog, Axes, Chalice and Sun will take their respective positions on their platforms. The runners will take positions in the Wardog and Chalice quadrants (since this is where they will enter the gauntlet). When the event begins, adds will spawn out of doors that are toward the outer perimeter of the arena in each quadrant. The runners will float and help kill adds until they are all down. Once this is done, the runners will enter the gauntlet by picking up the orbs. The guardians on the platforms will have to listen for callouts from the runners and each engage one of three large arrows that are on the perimeter wall of the arena. Successfully doing so will allow the runner to advance through a gate and into the next quadrant of the gauntlet. This is repeated four times until the runners are able to leave the gauntlet with an orb which is then placed in the center of the arena. This whole process is repeated three times (bringing a total of six orbs to the middle of the arena) before moving to phase two. In phase two, the entire raid team will enter the gauntlet and this phase will be explained in detail below. Once phase two is done, the encounter is completed. In phase one, only the runners will be making callouts. These will be “Dog top, middle or bottom”, “Axes top, middle or bottom”, “Chalice top, middle or bottom” and “Sun top, middle or bottom.” For the Guardians on the outside, these callouts refer to the circle inside the gauntlet that is illuminated with a red ring that the runner needs to go through. During phase two when everyone is in the gauntlet, there will be several callouts being made and those will be explained in detail below. If you are assigned to one of the outside platforms, you are simply responsible for paying attention and listening to the callouts being made and reacting to them. If you are assigned as a runner, you need to be able to give clear callouts to the rest of the raid. The guardians assigned to the platforms are responsible for managing the trash in their assigned quadrant, hitting the correct arrows to provide forward progress for the runner, quickly killing the Councillor that will spawn in their area and then lastly hitting the next arrow to again provide forward progress for the runner. Once the event has started, trash will spawn out of two large doors located perpendicular to the perimeter wall of the arena in each quadrant. There will be three waves of trash mobs. Once all of these waves have been cleared, an elite, solar shielded Centurion will spawn out of one of the doors in each quadrant. Once all of these elite Centurions are killed, the Runners will be able to pick up their assigned orb and enter the gauntlet in the Wardog and Chalice quadrants respectively. The Guardians on the platforms need to listen for callouts from the Runners. The Runners will give a command on which arrow to NOT shoot. 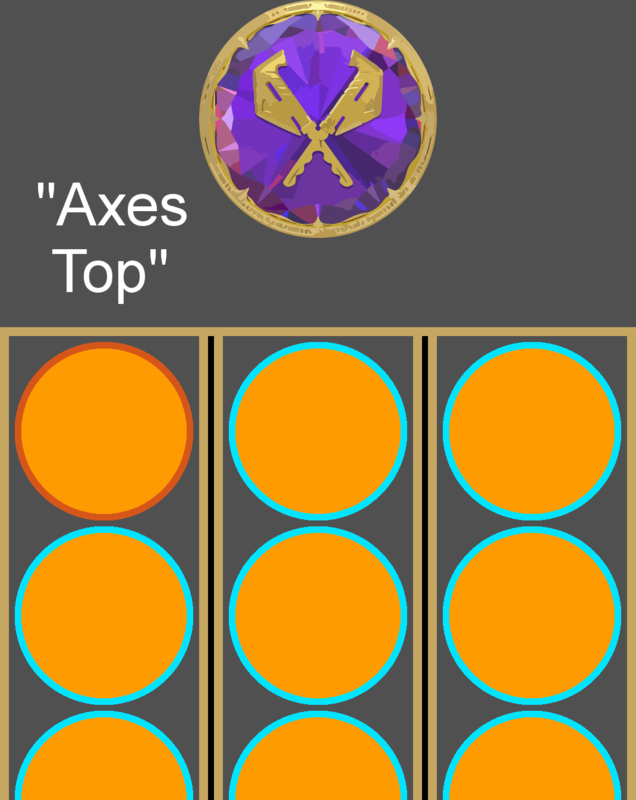 Team 2 (Wardog and Axes) and Team 3 (Chalice and Sun) will engage their respective arrows as a team from their platform. The arrows can only be engaged while standing on the platforms. The platforms are teamed for a reason and each platform Guardian is designated to shoot the uppermost or lowermost arrow. This is to prevent confusion when determining what arrow to shoot when you get the callout from the runner in your area. The platforms will engage targets as follows: Wardog is responsible for uppermost / Axes is responsible for lowermost / Chalice is responsible for uppermost / Sun is responsible for lowermost. To put this into context, let’s say the runner who enters the Chalice quadrant says “Chalice middle.” That is the cue for the Team 3 Guardians (Chalice and Sun platforms) to shoot the top and bottom arrows, while ignoring the middle one. Chalice Guardian will shoot the top arrow (uppermost) and sun guardian will shoot the bottom arrow (lowermost.) Using the same team, let’s say the runner says “Sun bottom.” This means the Chalice Guardian, while still standing on their platform, will pivot to target the arrows in the Sun quadrant and shoot the top arrow (again uppermost) while the Guardian in the Sun quadrant will now shoot the middle (since it is the lowermost of the two arrows being engaged because the bottom arrow is being omitted.) The Guardians will only leave the platforms to deal with the Councillor that spawns in their quadrant. Successfully engaging the arrows will result in the arrows turning green, spawning an orb for the runner to extend their timer and instantly unlocking the gate allowing them to make forward progress. Failing to shoot the correct arrows will turn them red causing no orb to spawn for the runner and giving them a short delay before unlocking the gate. When the runner passes through the gate in each quadrant, a Councillor will spawn. Quickly dispatching Councillors is the only time you will leave your platform during this event. When the runner passes through the gate after the arrows have successfully been engaged, a Councillor will spawn close to the arrows that can only be killed via melee. A sword will make quick work of them or you can simply punch them. Once the runner is through your quadrants’ gate - immediately leave your platform and head towards the arrows stopping a few yards short. The Councillor will spawn with a shield around it and if you are too close, the shield will push you back a little bit. Simply run through the shield, melee kill the Councillor and then immediately get back on your pillar, pivot and be ready to engage your team members set of arrows. If you do not kill your Councillor quick enough, an additional Councillor will spawn off to the side and will be immune to melee damage and will need to be range killed. This process is rinse and repeated three times until the two runners and have traveled back to the center of the arena with a collective total of six orbs. 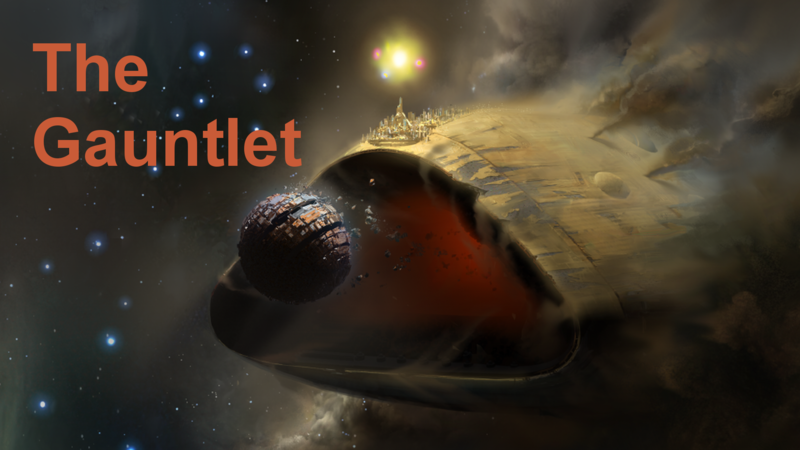 It is important to note that the platforms will begin to move up and down as the runners make progress through the gauntlet and the raid makes progress through the event. The Runner’s responsibility is to help kill trash in the quadrant where you will enter the gauntlet (Wardog and Chalice.) Once the elite Centurions have been killed, the Runners will pick up an orb that is located under the arrows, along the perimeter wall. One of the runners will give a countdown command of “3-2-1-go” - picking up the orb on “go.” Successfully picking up the orb will teleport you into the gauntlet. Once you are teleported into the gauntlet, you will be stuck in place for a few second behind an orange energy barrier. Use this time to look towards the gate in front of you which is comprised of six full rings and three half rings at the bottom. 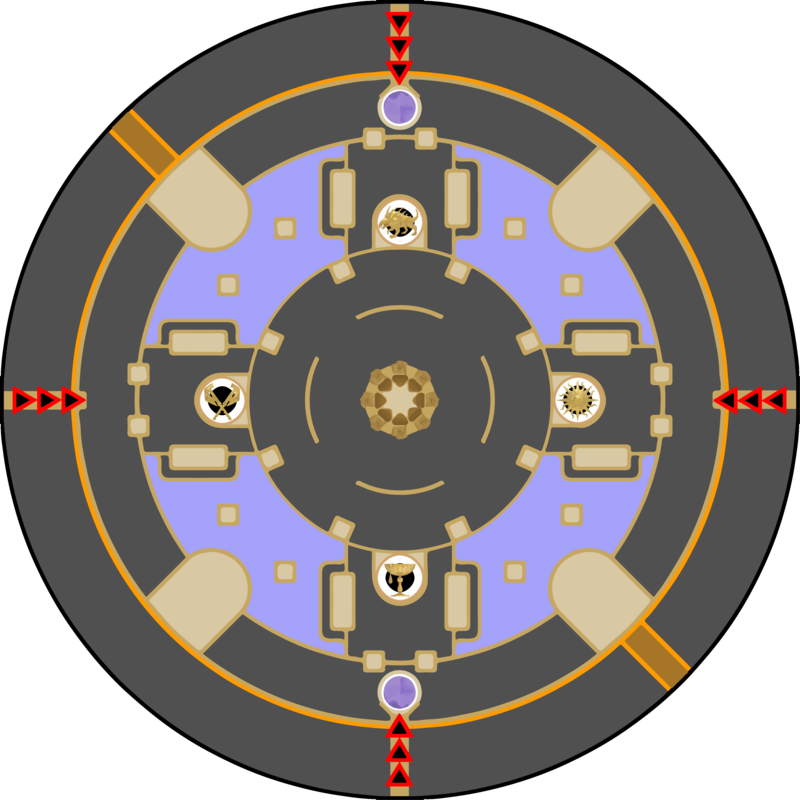 Above the gate towards the ceiling will be a giant crest of your quadrants’ identifier (Wardog, Axes, Chalice or Sun.) Every time you start the gauntlet, you will be ported into the same quadrant where you picked up the orb (meaning one runner will always start in Wardog and the other in Chalice.) When looking at the gate in front of you, one ring will be red - it is the row that this ring is in that you want to call out. So if the runner in the Wardog quadrant sees that the ring that is red is in the top row, that runner will call out “dog top.” This signals to the guardians on the two platforms responsible for this quadrant, which arrows need to be shot to open your gate so you can progress. The only gate you will get to call out standing still is the one immediately in front of you after entering the gauntlet. The rest of the gates you will need to call out on the move. The orb you are holding is like a ticking time bomb. You add time to your bomb by jumping (or sliding for the bottom) through the hole in the gate whose ring was marked in red. 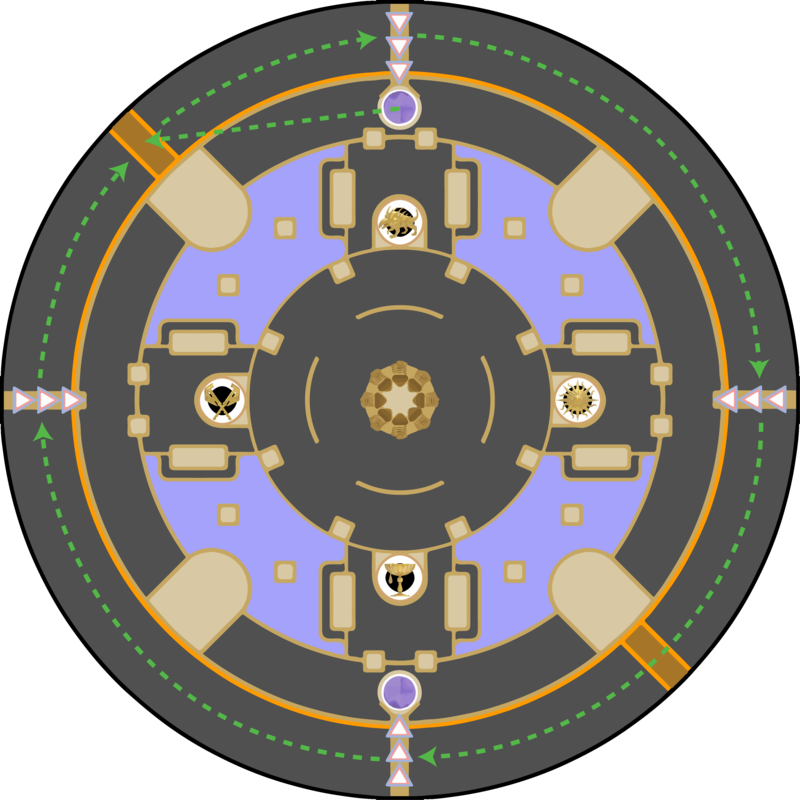 When the platform team successfully engages the arrows, the gate will open and there will be an orb floating in the center of that hole (that was marked in red.) You need to jump (or slide) through that hole to grab that floating orb, thus adding additional time to the orb you are carrying. Once through the gate, make your way as fast as you can towards the next gate. Call out the identifying crest near the ceiling of the next gate and the associated row with the hole marked by the red ring as quickly as you can. Rinse and repeat until you come to the end of the gauntlet. Run into the orb that is at the finish line and that will teleport you out of the gauntlet and back into the arena where the whole raid started the event. Run to the middle of the arena and slam the orb into the table like object that is in the middle. Rinse and repeat two more times. After the first time through the gauntlet, there will be sections of the floor missing. If you fall into a missing section, you will die and wipe the raid. Once phase one has been completed three times, everyone in the raid will meet in the middle to pick up one of the six orbs which will then teleport them into the gauntlet. All six raid members will have an orb, that is ticking down wanting to blow you all up. Every raid member will need to add time to their orb. The challenge during this phase is that there are only four orbs in each gate and six ticking time bombs being held by the raid group. We organized the raid into teams for a reason. During this phase, the raid leader will call out a team. The team you hear is the team that will NOT go for an orb to recharge the timer on the bomb they are holding. Putting this into context, let’s say the raid group approaches a gate. The raid leader calls out “Team 1.” This means that Team 1 will find any open holes in the wall of their choice that do not have an orb floating in it, and they will go through those holes. Team 2 and Team 3 members will quickly each find a hole with a floating orb and call out which one they are going for. If more than the same raid members calls out for the same orb, the person who called it first goes for it. Don’t be nice and say “Okay you take it Timmy.” This is not a time to be nice - you call out your orb, you adjust as fast as you can, you grab/absorb the orb that’s in the hole you are committed to and you sprint to the next gate. As the raid team progresses through the gauntlet, the floor will begin to drop and open up in certain areas, so be careful and try not to bump people as they are jumping. Once four gates have been hurdled through as directed above, the team will approach the finish line. There will be six orbs floating on the ground. Everyone needs to cross the finish line into an orb and that will port the individual out of the gauntlet and back into the arena. As you are ported out (don’t wait for those lagging behind), run into the middle of the arena and slam your orb into the table like object that’s in the center. On Normal Mode, only four people need to make it through the gauntlet and slam their orb into the center table in the arena. We believe on Prestige Mode, it will be all six. Listen and pay attention! If you have questions or forget your assignments, please ask!